Posted by Capital Living in Art & Entertainment, Business, Events Calendar, Family Activities, Frankfort Area Chamber of Commerce, Frankfort Nightlife, History, News, Public Service Annoucement, Tourism, What To Do In Frankfort This Weekend?, What To Do This Weekend in Frankfort?, What's Happening This Weekend In Frankfort? Basketball, Basketball Tournament, Capital Living, Touchstone Energy All "A" Classic, What's Happening This Weekend In Frankfort, What's Happening This Weekend in Frankfort..., What's To Do In Frankfort? DON’T MISS A MOMENT OF CAPITAL LIVING BY FOLLOWING US EVERYWHERE!!! 8:30 am – 11:00 pm – Touchstone Energy All “A” Classic Basketball Tournament, Frankfort Convention Center. Don’t miss some of the BEST high school basketball in the commonwealth! The Touchstone Energy All “A” Classic Basketball Tournament is in town through Sunday. Friday bring on Round 2 of both girls’ and boys’ basketball play in the Quarterfinals. Follow ALL the excitement by FOLLOWING Capital Living on Twitter @KYCapitalLiving. Photos, updates, scores and more! Game times for Friday are 8:30 am, 10:00 am, 11:30 am and 1:00 pm for GIRLS and 5:00 pm, 6:30 pm, 8:00 pm and 9:30 pm for BOYS. See the brackets below for teams and specific times. These are the updated brackets for the tournament. Come on out and support these regional champions on their quest for a state title! 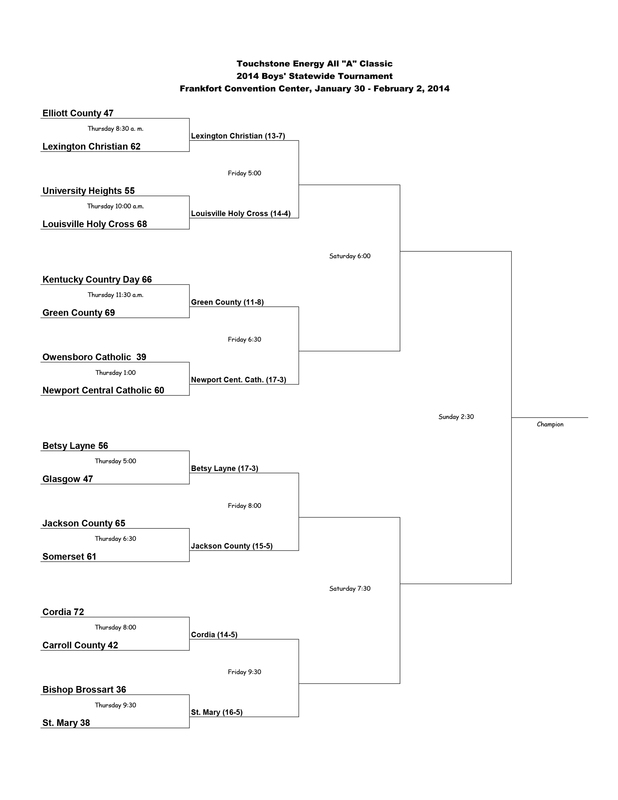 To download your girls’ tournament bracket, click HERE. To download your boys’ tournament bracket, click HERE. 8:30 am – 2:00 pm – Blood Donation Drive, Franklin County Chapter American Red Cross, 318 Washington St. To schedule an appointment call 223-1795. The Sax Lunch Special featuring The Sammy Coulter Show will resume in April. Your visits to the Rhonda Gauthier Fine Art Gallery, 115 Bridge St, are always welcome. Tuesday- Saturday from Noon to 5:00p.m. except on Friday (closed at 4:00p.m.) Please call 502-320-3856 or come to 115 Bridge Street! 4:00 – 7:00 pm – Wine Tasting, at Capital Cellars, 227 W Broadway. Info: 352-2600. Try LUNCH at Capital Cellars, 10:00 a.m.-2:00 p.m. daily. Serving sandwiches, salads and homemade soups! 5:00 – 8:00 pm – Exhibition: The Unique Personality of Greg Seigle; Paintings, Drawings and Sculpture: Opening Reception, Capital Gallery, 314 Lewis St. Gallery Hours: Tuesday-Saturday, 10:00 a.m.-5:00 p.m. Info: 223-2649. Live music featuring Chris Fallis, 7:00-10:00 p.m. HAPPY HOUR! 3:00-7:00 p.m. all week! at La Fiesta Grande (The Little Monkey), 334 St. Clair St., Featuring Domestic Draft Beer, $2.99 and All Imported Bottle Beer for $2.50. Info: 352-2359. 7:00 pm – Special performance by the acoUstiKats, Inside Llewyn Davis, 7:30 p.m. at The Grand Theatre, 308 St. Clair. Inside Llewyn Davis is the latest film by the team of Joel and Ethan Coen, who gave us Fargo, Oh Brother Where Art Thou, Big Lebowski and others. Tickets are $8. Info: 352-7469. Superfecta at The Brick Alley, 325 St. Clair. Info: 875-2559. 10:00 am – Touchstone Energy All “A” Classic Basketball Tournament, Frankfort Convention Center. Don’t miss some of the BEST high school basketball in the commonwealth! The Touchstone Energy All “A” Classic Basketball Tournament continues on Saturday with the Semifinals for both girls’ and boys’ basketball. Follow ALL the excitement by FOLLOWING Capital Living on Twitter @KYCapitalLiving. Photos, updates, scores and more! Game times for Saturday are 10:00 am and 11:30 am for GIRLS, and 6:00 pm and 7:30 pm for BOYS. 1:00 – 4:00 pm – Gourd Sculpture: Sculpting Faces Class, at Full Circle Studio & Gallery, 121 Bridge St., Students will use a self hardening clay to sculpt faces onto gourds or any other surface. $50/person. Register by sending payment through mail or by paypal at createfullcircle@gmail.com. See full list of classes HERE. 3:00 – 7:00 pm – HAPPY HOUR! 3:00-7:00 p.m. all week! at La Fiesta Grande (The Little Monkey), 334 St. Clair St., Featuring Domestic Draft Beer, $2.99 and All Imported Bottle Beer for $2.50. Info: 352-2359. 5:00 – 7:00 pm – Join The Light Clinic for a Chinese New Year Celebration. 2014: Year of the Yang Wood Horse, 5:00-7:00 p.m. at China Wok. Buffet-style dinner with drinks. Beer & Wine included. $15/adult, kids $5 (12 and under). All are welcome, please RSVP at 330-4233. 7:30 pm – Inside Llewyn Davis, The Grand Theatre, 308 St. Clair. Inside Llewyn Davis is the latest film by the team of Joel and Ethan Coen, who gave us Fargo, Oh Brother Where Art Thou, Big Lebowski and others. Tickets are $8. Info: 352-7469. Live music featuring Twist of Fate, (70’s & 80’s covers) at The Brick Alley, 325 St. Clair. Info: 875-2559. Chili Cookoff, 4:00 p.m. and live music featuring Kyzer, 9:00 p.m. at The Dragon Pub, 103 W Main St. Info: 875-9300 or www.dragonpub.com. 12:00 – 5:00 pm – Touchstone Energy All “A” Classic Basketball Tournament, Frankfort Convention Center. It’s come down to THIS…the FINALS of the Touchstone Energy All “A” Classic Basketball Tournament concludes on Sunday with the Finals for both girls’ and boys’ basketball. The best of the best have made it all the way to the state finals in Frankfort. Follow ALL the excitement by FOLLOWING Capital Living on Twitter @KYCapitalLiving. Photos, updates, scores and more! Game times for Saturday are 12:00 pm for GIRLS, and 2:30 pm for BOYS. 2:00 pm – Inside Llewyn Davis, The Grand Theatre, 308 St. Clair. Inside Llewyn Davis is the latest film by the team of Joel and Ethan Coen, who gave us Fargo, Oh Brother Where Art Thou, Big Lebowski and others. Tickets are $8. Info: 352-7469. The Plaza Grill and Deli, Now Open For Breakfast! 6:00-11:00 a.m. and serving lunch, 11:00 a.m.-2:30 p.m., located inside the Capital Plaza Hotel, 405 Wilkinson. Tina Emerick and the entire culinary team welcome you to see the new restaurant and try the great new menu! Info: www.capitalplazaky.com. 10%OFF for Government Employees, Active and Retired Military and Seniors 65+! Frankfort Yoga Studio, Beginner’s Gentle Yoga,10:30-11:30 a.m. and 5:15-6:30 p.m., Lunch Time Yoga, 12:10-12:50 p.m. Intermediate Yoga, 5:15-6:30 p.m., 306 W Main St, 3rd floor. Info: 227-3276. Chicken fajitas, $8.99 and Lime Margaritas, $1.99 All Day! HAPPY HOUR! 3:00-7:00 p.m. all week! at La Fiesta Grande (The Little Monkey), 334 St. Clair St., Featuring Domestic Draft Beer, $2.99 and All Imported Bottle Beer for $2.50. Info: 352-2359. The Dragon Pub, 103 W Main St. Info: 875-9300. 2 entrees per $15.00, ask server for details. HAPPY HOUR! 3:00-7:00 p.m. all week! at La Fiesta Grande (The Little Monkey), 334 St. Clair St., Featuring Domestic Draft Beer, $2.99 and All Imported Bottle Beer for $2.50. Info: 352-2359. Kentucky National Guard Memorial Fund Presents: Exile and Delbert McClinton, Saturday, February 8, 7:00 p.m. at the Frankfort Convention Center, 405 Mero St. Click HERE for tickets! Kentucky State University Concert Choir, Under the Direction of Dr. Phillip J Rogers Sunday, February 9, 10:45 a.m. in the sanctuary at First Christian Church, 316 Ann St. 223-2346. Wine Classes, Tuesdays starting February 11, through April 1 (8 weeks) at Capital Cellars, 227 W Broadway. Cost $80. Email capitalcellars@fewpb.net, call 352-2600 or stop by to sign up! Buffalo Love, a unique dinner featuring Buffalo Trace’s award-winning Bourbons and sumptuous cuisine. Tastings led by Drew Mayville, Master Blender. Optional Tour, 6:00 p.m. Dinner, 7:00-9:00 p.m. at Buffalo Trace Distillery, on Valentine’s Day, Friday, February 14. $75/person. For reservations email events@buffalotrace.com or call 696-5930. Join the Meeting House Bed & Breakfast, 519 Ann St, for a Valentine’s Day to remember, Friday, February 14. Enjoy pink champagne and chocolate covered strawberries for an appetizer, then choose from 3 different menu options, including prime rib, chicken imperial, or a vegetarian pasta dish, complete with salad, sides, rolls and dessert. Prices range from $75-$50/couple + tax & gratuity. Reservations Only! Info: 226-3226. Celebrate Valentine’s Day Weekend with tea and romance! Friday, February 14 and Saturday, February 15. Enjoy a cozy Luncheon Winter Tea in the historic 1835 Orlando Brown House, 202 Wilkinson St. Featuring their very own House Blend Tea by Elmwood Inn, tea will be served with a 5-course menu by Springhill Cookie and Catering Co.$25/person. Please call 227-2560 for reservations. Bridal Bliss, Bridal Show, Saturday, February 15, 11:00 a.m.-4:00 p.m. at the Frankfort Convention Center, 405 Mero St. FREE and open to the public. Info: 564-5335.